The fat tire electric bike adds a whole new dimension to cycling fun. The tires that are 4 inches wide, on average, enable the rider to ride on almost any surface including mud, snow, sand, and loose stone. With the wider and softer tires the ride is cushioned and the grip is outstanding. When you add the electric motor for pedal assist you have a combination that is hard to beat. Not only do these bikes enable you to go more places that you could before they extend the riding season so for the hardy souls that ride in the winter it is much more do-able in the snow. It is also noteworthy that with the wider and softer tires (10 to 15 psi) most riders choose to forego the suspension since it adds to cost and maintenance. Most electric bikes now use lithium ion batteries that are smaller, lighter in weight, and more power dense. They are typically removable and charge within a few hours. 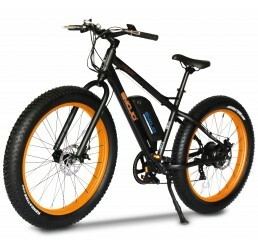 Like most electric bikes the fat tire electric bikes have a range of 20 to 30 miles at a max speed of 18 to 20 mph. The Surface Boar shown below is one exception having a range of 50 mile max. Most fat tire electric bikes use disc brakes for exceptional stopping power. The Baad Rad is one of the most popular fat tire electric bikes. 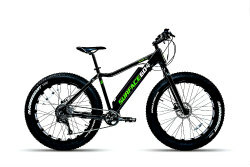 Baad Rad Fat Bike Electric With it's 26 x 4 ultra-wide rims and fat tires you get a super-smooth ride and killer looks. 500W motor provide great performance.